Warehouses are busy, bustling spaces teeming with workers on foot and large pieces of equipment working as efficiently and productive as possible. Two very important parts of any warehouse are the forklifts and their operators. If you’re an employer of a warehouse of any kind, you know how important it is to have knowledgeable workers performing tasks, properly maintained equipment, and safety practices in place to prevent accidents. But what if you’re missing a few tools that can further improve safety and daily practices? 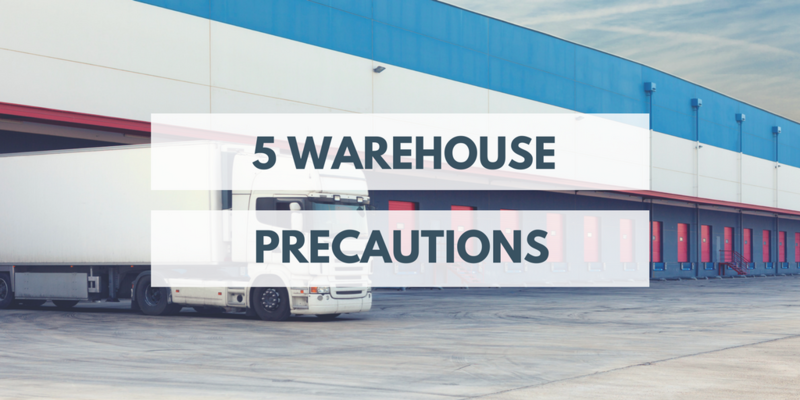 Find out what they are below and improve your workplace with these smart warehouse precautions. If your warehouse is laid out with various structural columns throughout the space that can get in the way of traffic flow, column protectors have keep your warehouse from getting damaged during any collisions. They are made with impact-resistant material that creates a barrier between a forklift, pallet jack or other equipment, and increases visibility with a bright color. Columns are often the same tone as the ground and surrounding walls in a warehouse, making them less noticeable when coming around a corner or handling a front load. Column protectors can protect your building and workers from destructive collisions. In addition to protector systems, high visibility paint can protect other areas in your warehouse, including workers who are operating the forklifts. High visibility paint can be used on structural columns and beams, around door frames, and on the floor to mark “no drive” zones. Brightly colored paint warns operators near and far of stationary objects and alerts them to stay clear. Even with high visibility paint and other warning signs, operators carrying front loads are acutely aware of their load but not as much to the environment, and can come into contact with fixed objects and other workers. To prevent loads from reducing an operator’s line of sight and blocking any obstacles, install mirrors on the walls of the warehouse and on each forklift to provide operators with an additional visual aid. A governor is a product that can be installed on forklifts to limit the speed the forklift can travel. The pressure to be as productive as possible and complete tasks quickly can tempt operators to increase their speeds. While faster may seem to be better, it isn’t a benefit to the workplace if it causes accidents that puts a forklift out of production and forces operators onto manually-powered machines. Speed limiters ensure forklifts aren’t exceeding the speed limit you determine as safe for your warehouse, and can help prevent collisions that are the result of too-high speeds preventing workers from seeing or stopping in time for obstacles or pedestrians. If you’ve tried just about everything to make your workplace safer and prevent accidents in your warehouse, then your operators may simply need to receive refresher training. Renewal training goes over everything workers learned in their initial forklift training class, and re-teaches safe practices, proper speed and maneuvering techniques, and how to recognize and avoid hazards. Choose CertifyMe.net for the most convenient and affordable OSHA-compliant training. Our Training Kit teaches all main classes of forklifts to new operators, and provides free renewal training for life! Proper training is the key to preventing accidents in any workplace, and you can improve the safety of your warehouse and reduce any accidents through our online programs.